This recipe is 9 Freestyle points per serving on Weight Watchers, 1 cup. In a medium non-stick skillet, heat the olive oil spray to medium heat. Add the ground turkey and stir occasionally until the meat is cooked through and no pink is left. Drain and set aside. 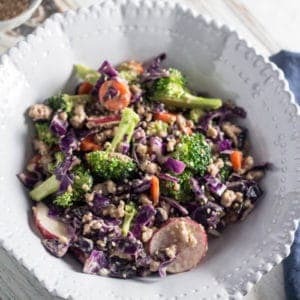 In a large bowl, toss the chopped red or green cabbage, broccoli, radishes, carrots, peanuts and avocado together. Add the cooked turkey into the chopped salad and toss to combine. In a small bowl, whisk together all of the dressing ingredients. Pour the dressing over the turkey and chopped salad and mix to combine. Serve immediately.